Cleckheaton overseas player Tayyab Tahir struck a second successive century but was unable to prevent his side slipping to defeat against Bradford and Bingley in the Bradford League Premier Division last Saturday. Woodlands secured a third straight win in the Allrounder Bradford Premier League last Saturday as they defeated Methley by 38 runs. Since losing on the opening day of the season, Woodlands have gone on an unbeaten run and are now one of five teams with three wins from their opening four matches and trail joint leaders Hanging Heaton and New Farnley by six points. Methley overseas player Waqar Ahmed arrived in the country 24 hours before the match, while the newly promoted side also had Adam Patel on debut and both made useful contributions. Woodlands posted 219 batting first as Liam Collins led the way with an unbeaten 69. Marcus Walmsley was the pick of the bowlers with 4-59, while fast bowler Ahmed took 3-43 on debut. Patel led the Methley reply with an unbeaten 65 but they were bowled out for 181 as Woodlands opening bowlers Mohammed Bilal (4-56) and Elliot Richardson (3-44) struck the crucial blows. Cleckheaton overseas player Tayyab Tahir struck a second successive century but ended up on the losing side as Bradford and Bingley claimed their first win of the season. Tahir took a liking to the Bingley bowling attack and made 126 from just 86 balls, as he struck eight sixes and 14 fours to help his side post 250-9 and pick up maximum batting points. However, Tahir’s efforts were bettered by Bingley overseas man Kyme Tahirkeli, who led his side’s successful run chase with a maiden Bradford League century. Tahirkeli made 142 not out from just 134 balls and struck seven sixes and 14 fours on the way. Captain Matthew Duce (40) supported Tahirkeli’s excellent innings as Bingley reached their target with eight balls to spare. 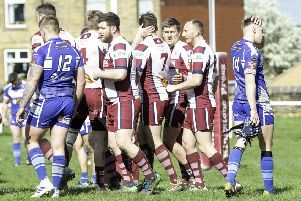 Defeat leaves Cleckheaton joint second-bottom with Townville, 24 points above winless East Bierley. Scholes’ hopes of a third win in a row were shattered at Lightcliffe, who recorded a comfortable seven-wicket win. Opener Asitya Waghmode (35) and Yasir Ali (33) were the top scorers but Scholes were restricted to 162-8 as spinner Josh Wheatley claimed 4-34. Lightcliffe openers Alex Stead (70) and Wheatley (56) shared a 129-run first wicket partnership which set the platform for them to ease home in 33.5 overs.